Visual Studio 2008 sp1 introduced background compilation so it can underline errors while editing (like Word underlines misspellings). It's been in Resharper for ages. You can have both Resharper and VS error underling- they don't conflict. In Visual Studio 2010 it's off by default (and Resharper 5 isn't released yet), so you need to turn it on. It's Tools-Options-Text Editor-C#-Advanced. 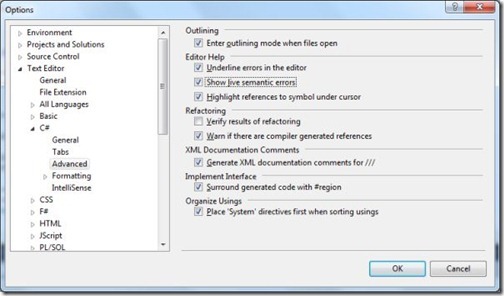 Check underline errors in editor and show live semantic errors.